Despite Kramnik's imposing play against Topalov on board one, Bulgaria actually took the lead in their match versus Russia as man in form Valentin Iotov torpedoed heavy favorite Sergey Karjakin with the black pieces on board three. 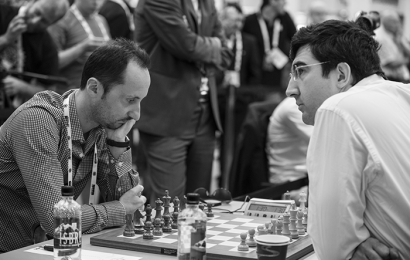 But the decision in the battle of the ex-world champions went to Kramnik, who won a nice game over his rival to even things up. Ian Nepomniachtchi could not make an impression on GM Krasimir Rusev in the last game to finish, and the Russians were held to a draw for the second day in a row.